Reconciliation after bloodshed may be difficult but it is the only path to hope, Pope Francis has told a large group of Sri Lankan pilgrims. “It is not easy, I know, to heal the wounds and co-operate with yesterday’s enemy to build tomorrow together, but it is the only path that gives hope for the future,” the Pope said during a meeting with an estimated 12,000 Sri Lankan pilgrims. From 1983 to 2009, Sri Lanka was involved in a bloody internal conflict. Rebels from the Liberation Tigers of Tamil Elam carried out a violent campaign seeking autonomy for the Tamil majority in areas north and east of Sri Lanka. 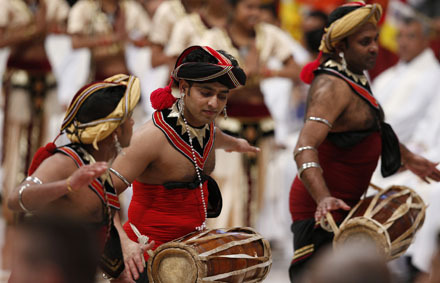 Sinhalese make up the majority of the country’s 20 million inhabitants. Cardinal Ranjith had told the Pope that the more fortunate among the pilgrims work as housekeepers, caregivers or factory workers in Italy. The others, he said, have part-time jobs or no work at all; “many live in harsh and difficult conditions”. Pope Francis asked the pilgrims, who were marking the 75th anniversary of the consecration of their country to Mary, to share with him some of their songs. 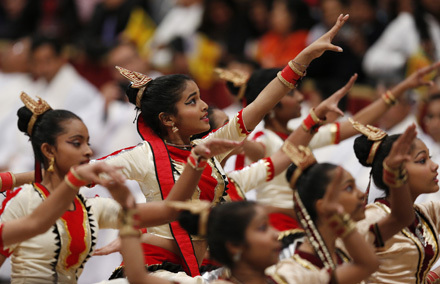 The Tamil- and Sinhalese-language choirs and dancers were happy to comply.